This article was published in 2018, when Governor DeSantis was a still member of Congress. 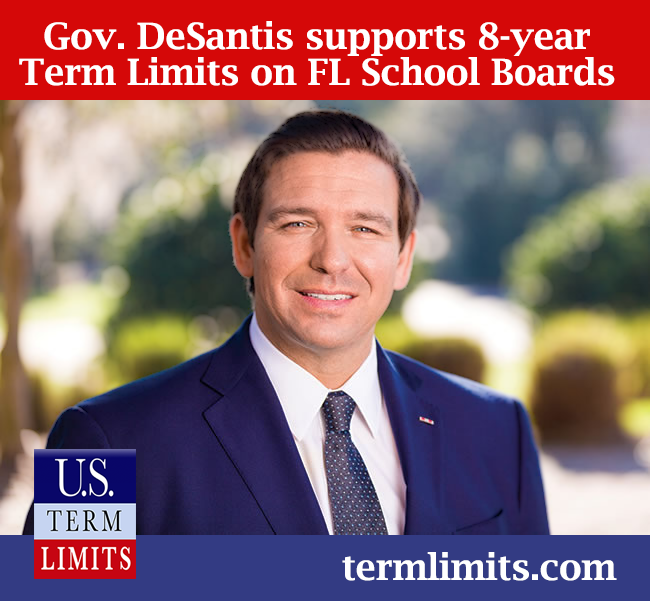 Since his swearing-in as Governor, DeSantis has re-affirmed his commitment to 8-year school board term limits. In our oft-divided political climate, it’s vital to pursue reforms that bring people together and restore power to citizens— even when those ideas won’t win friends among the permanent political class. I’ve found that no issue unifies like term limits. The people of Florida, regardless of party affiliation, have reached the same verdict Benjamin Franklin did centuries ago: rotation-in-office is the lifeblood of our republic. No elected office, whether federal or local, is ever better off when run by career politicians. That’s why I support eight-year term limits for all school board members. I am confident this proposal would bring new energy and ideas to school boards, which too often suffer from the same untamed incumbency that paralyzes Congress. In Washington, where I am finishing my third and final term in the House, we do not have the luxury of using checks and balances to pass term limits. The same D.C. power brokers who’d be affected by congressional limits are the ones whose votes we need to pass it. The benefits of term limits are clear. When an elected official is first seated, he or she comes in with a reformer spirit and desire to deliver change. But perpetual re-election tends to erode that public service outlook and replace it with one of entitlement. Long tenure in office tends to make people forget they work for us, and not the other way around. It makes for a fine catchphrase but Floridians know better. They see clearly how incumbents at all levels can stack the deck to ensure there’s never real competition for their seats. Between name recognition, seniority and control of campaign finance — incumbents maintain a distinct edge. And that only gets worse with time. In 2016, 39% of school board incumbents didn’t even have a challenger and were re-elected unopposed. By creating an open seat every eight years, term limits level the playing field. Term limits bring down barriers to entry so Americans from all walks of life can have a shot at elected office, just as the framers’ intended. Due to term limits, Florida will be electing a new set of statewide officeholders in 2018. At the same time, a number of state legislators, county commissioners and city council members will be hitting their eight-year maximums, ushering in a wave of new energy across our state. But school board incumbency, thanks to a lack of term limits, will continue to grow unabated. That must change. I encourage a “yes” vote on school board term limits this November. and was the introductory sponsor of HJR6, a Constitutional Amendment for Term Limits on Congress. He is a Lieutenant Commander in the Navy Reserves and currently serves as Governor of Florida.